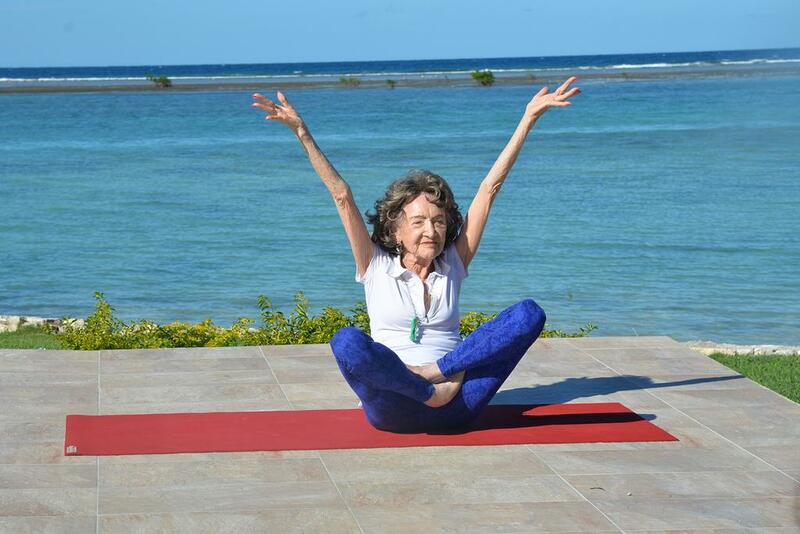 If you are looking to stay healthy and fit into the later years of your life then follow the example of this amazing Yoga Teacher, who is yes 91 years old. She is not the only example of the wonderful benefits of yoga, if you are looking to live a long and healthy life. Just look around at the yoga teachers you know, and I am sure you will notice that their energy and body do not reflect their age. Yoga is perhaps one of the best ways to preserve your youth, as it works on so many different levels of your being. From helping you stay strong and flexible, to helping you reduce stress and anxiety, to helping you unleash your full inner potential so that you can live a satisfying life, yoga does all that and more. 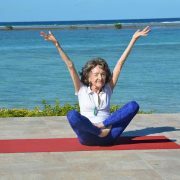 In this article I will present the inspiring video link of Senior Yoga Teacher and below that I will outline some nice yoga sets and breathing exercises to help you regain your vigor and energy, no matter what your age. If you are looking for more inspiring videos of seniors doing and TEACHING yoga, just stop by YouTube and do a quick search. Many more inspiring videos are available there. Of course if you are elderly please first check with your medical service provider before starting any new fitness or yoga routine. 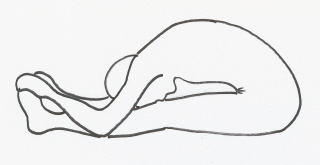 Then also please take it slow and gently, allowing your body to adjust and develop as you deepen your yoga practice. Below also are some important article with guidelines that you should follow when practicing yoga and pranayama (yoga breathing exercises). A good way to start off your yoga practice is with a good set of breathing exercises. These exercises have a wide range of wonderful benefits, which are detailed in each of the articles referenced below. You can do this set sitting on a chair or sitting cross legged. The full details of this particular set can be found in the article: Simple Chair Yoga for Energy and Stress Relief. Again, please make sure you go nice and slow and don’t overdo it. Sit up nice and straight and have your feet flat on the floor. Try not to use the back support of your chair if you are using one. 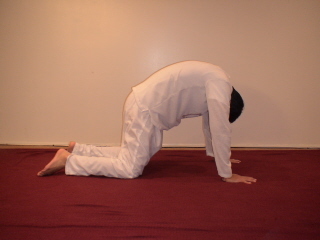 Elongate your spine upwards and bring your neck back slightly, like a soldier at attention. 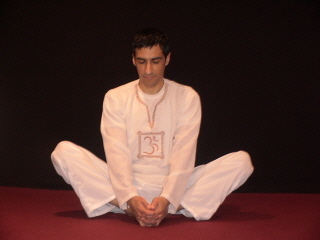 Place your hands on your knees, relax your shoulders and let your stomach become soft and relaxed as well. You can close your eyes of if you like. Now begin the beginner’s version of Bhastrika Pranayama. Here all I want you to do is breathe deeply. Let your abdomen and chest expand fully on the inhalation, and let them contract completely on the exhalation. Continue to do this long deep breathing for 1 full minute. This exercise will relax you and help your entire respiratory system. Next begin Breath of Fire Kundalini Yoga style for 1 full minute. Keep in mind that if at any time you start to feel dizzy or feel you are overdoing it, either slow down or switch to normal breathing till you feel ready to continue again. The other key with Breath of Fire is to make sure your inhalation and exhalation are equal, or you will end up with too much or too little air and have to reset and restart. Breath of Fire is going to wake you up, get your energy flowing and harmonize your entire system. Next do 1 minute of the wonderful Kapalbhati Yoga Pranayama. This is a great exercise to optimize your health and help your body heal. While doing this exercise make sure you visualize any negativity leaving your system with each exhalation. Finally, do the following breathing pattern for the last 2 minutes to really soothe your system, focus your mind and help you feel integrated, centered and connected. This is called Step Breathing. Inhale slowly taking 5 seconds to complete the inhalation, hold your breath in for 5 seconds, exhale slowly taking 5 seconds to complete the exhalation and then hold your breath out for 5 seconds. So 1 entire cycle will take 20 seconds, and you will be able to do 6 full rounds of this breathing in the 2 minutes. If the 5 second intervals are too much initially, just start with 2, 3 seconds or 4 seconds and work your way up. After you are done with your set close your eyes and relax for a few minutes. For the yoga set and yoga practice I have 2 good recommendations for seniors and the elderly. They are the following 2 yoga sets which you can find on the website. Both are excellent to do and both consist of simple, but highly rewarding exercises. These 2 sets are the Spinal Warm-up Yoga Set and the Basic Yoga Set for Beginners. You can even do both sets if you like, with Spinal Warm-up first, followed by the Basic Yoga Set for Beginners. I have provided a modified version of the Beginner’s Yoga Set which I think will be even more suitable for seniors below. As mentioned above the Spinal Warm-up Yoga Exercises is excellent for seniors and you can start with that set if you like. Here is the video for that set. Be sure to use the modified versions if you find doing the full version difficult. This is a great pose for the elderly to do. 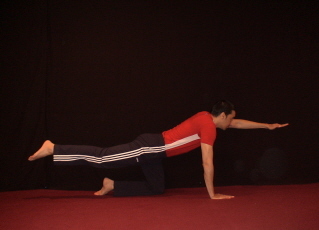 Just do one arm or one leg at a time if doing both is too difficult. The important part of this position is to keep your legs straight. It is not necessary to reach your toes, that will happen over time. Just reach forward as far as is comfortable, while keeping your legs straight. For seniors even reaching their knees or shins is fine. Curl your toes back towards you though, even if you do can’t reach them to accent the stretch in your calves and hamstrings. This is a terrific yoga posture, remember the beginner’s version is to do one leg at a time instead. I suggest for seniors to start with just one leg at a time. They can even keep their heads down if they like. Again you can take breaks during this pose when you tire. The full version is illustrated below. The yoga sets and exercises above are an excellent way for you to keep your energy up and body and mind in shape as you age. For those of you who are enjoying the abundance of youth, the time is now to begin a good yoga practice which will then stand by you for the rest of your life. Helo Shri Anmol. Our best wishes to you. Seniors yoga – An excellent beneficial addition to your courses. The videos are par excellence. Now, I have a friend who is 66 years. He has lower back bulging disk problems. He is on ayurvedic treatment and his pain is totally relieved. 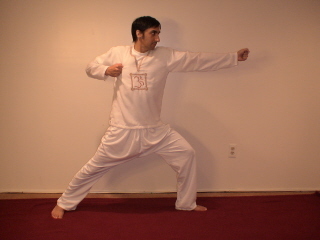 But he is very cautious about his forward and backward bending. Please come with Yoga postures for such patients or if you already have in your website, please give the reference, so that I can show it to my friend. He is dipressed because he is uanble to do yoga which are explained in your videos. Thanks and Namaskarams. Enjoy the process. Many would love to experience even what you are. Meditation is a blossoming of goodness…. don’t worry about the white light, etc. Just keep up your practice sincerely as you have been correctly advised. The sweet smell is considered to be that of your Higher Self or that of an angle’s presence. Sweet sounds often accompany meditation as well. I recently got this amazing yoga chair I’ve never felt better at the end of a long work day. It lets me focus on flexible hips all day long. I no longer lose ground that I had gained the day before on the yoga mat.